Posted on Wednesday, November 30th, 2011 at 6:49 pm in All Posts, Emotional Healing, Empowerment, Marriage & Relationship Help, Self Reflection. I remember years ago how my father and the four of us children would go walking up the hill into the woods to look for a Christmas tree. It was a somewhat magical time – one of those special times when we had fun with our father. 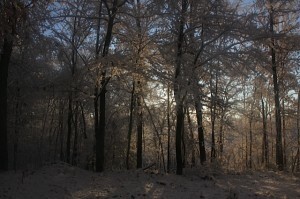 The trees would be beautiful, brown branches, dark green pines and firs that were covered with snow. Dad would be in a good mood. We looked for a tree the right size, but one that was growing under another tree and so doomed to a stunted life or an early death. It felt kinder to take a tree that didn’t have the same potential as the others. It was fun running through the snow searching for the tree. After some deliberation a decision was made. The fated tree was chopped down and we dragged it to the house. Sometimes a bit of the top would have to be cut off so that it fit in the living room. The stunted side would be placed to face the back corner in the living room – hidden, leaving the rest of it to be celebrated with ornaments and lights. Most of us tend to see ourselves as good and see others as more flawed. But like the tree with the stunted side because it grew under a bigger tree, we all have a stunted side. If we look closely, we all have aspects of ourselves that are beautiful and aspects that are less so. On the global scale these aspects are fairly easy to identify – philanthropy and acts of heroism as well as wars, murders, scandals, fraud, theft etc. But seeing our ‘stunted’ sides within ourselves is more difficult because we tend to hide them: our jealousies, insecurities, and our fears – even from ourselves. Like the Christmas tree, we show our better side. Like everyone else, I too have parts of myself that developed in a weaker way. While this stunted side of myself reveals where I was overshadowed and how I survived, it is also where I have my own character issues. What is meant by character? Character refers to qualities or traits, which determine a person’s response, regardless of circumstances, to the events of our lives. These qualities include: courage, trustworthiness, responsibility, benevolence, compassion, accountability, honesty, insight, integrity, patience etc. In reading the list, we recognize these qualities as important in our human development and our relationships. The absence of these same qualities will reveal ‘character issues’ – areas of greed, entitlement, fear, laziness, or some other way in which we are not fully in standing in our own power. Obviously, we tend to look up to people who have developed these qualities of character and will be more wary of those who have not – because they can (and do) more easily cause us injury. And often people have uneven development of these qualities that make up character. For example, they may be generous, yet also unable to be accountable for their own actions. Yet we often don’t ‘see’ the character of those loved ones closest to us clearly because of ‘attachment.’ Attachment means exactly what it sounds like – that we attach. I was very attached to the parts of my father that were beautiful ­– his intelligence, his talent, his uniqueness and his sense of humor, despite his flaws, his dark rages, his depressions, his selfishness. I was attached to him because I needed him and because I loved him. Attachment is part of being human, of being a mammal actually. We attach to our pets, our children, our friends, our partners, our teachers, our co-workers. And we generally attach quickly – often before we’ve had a chance to fully ‘see’ the entire spectrum of character of the person we attach to. Over the years, I have at times been confronted by ‘run ins’ with character issues – both my own and others. It is not enjoyable to suddenly be confronted with one of our flaws. Yet there is an important challenge here. Abe Lincoln has been quoted as saying, ‘Character is like a tree and reputation like its shadow. The shadow is what we think of it; the tree is the real thing.’ In this he alludes to the importance of character. What kind of a tree will we be? What kind of shadow will we be casting on the world? The wisdom of ‘know thyself’ is becoming more apparent. Will we look at ourselves and see our own flaws – those parts of ourselves that we have pushed aside and hidden away? And connected to this, when we have ‘messed up,’ can we make amends? Will we say that we are sorry and take the actions needed to strengthen the ‘weaker’ parts of ourselves? Will we be accountable to others and ourselves? Will we build our character? When it is an other person’s failing that impacts us however, we are often left feeling angry, sad or betrayed. We may have to take our attachment and break it – because to stay attached would be a betrayal to ourselves. How do we then move through these feelings to a place of acceptance and compassion? How do we not get stuck in feeling victimized by what occurred? It can be helpful to remind ourselves that everything that occurs to us has the potential to help us grow. Everything can be an initiation – meaning a way to trigger transformation to a higher way of seeing things, of relating to others and ourselves. Lets look at some guidelines to help with this process of developing ourselves. 1. Witness yourself and your feelings. For example: I feel rejected because you aren’t treating me respectfully. 2. Allow yourself to experience the feelings connected to this fully. For example: hurt, anger, shame. 3. Look at what your part is – whether it is just naivety, or accepting too little, or fear, greed or entitlement. 5. Look at your choices in this moment – you may not have external choices, but you do have internal choices. External– I cannot change this. Internal – I can choose to find another way to experience this. For example, I don’t want to hold onto anger or hurt so I decide that I want to hold an attitude of compassion and acceptance. If you can shift to this attitude of acceptance and release, you will feel lighter. You will be able to release the emotional turmoil that this event caused. You will feel more peace and move into a place that holds more wisdom. Tend the stunted side of your tree – let it have light and love. As you love that part of yourself, you will fill out and grow. The character trait of accountability is a good way to guide yourself through this process. Are you being accountable? To what part of yourself? To your truth, your integrity etc, or to your fears? Is the other person willing to be accountable and to look at himself or herself? Accountability is an essential ingredient of a relationship. Accountability allows a person to do relational work because it means that they are willing to look at and deal with their flaws. If only one person is being accountable, then the relationship will be lopsided. With accountability, two people can accomplish anything in their relationship.